Inter defender Stefan de Vrij. New Inter signing Stefan de Vrij insists his conscience is clear over a controversial final performance for Lazio at the end of last season. 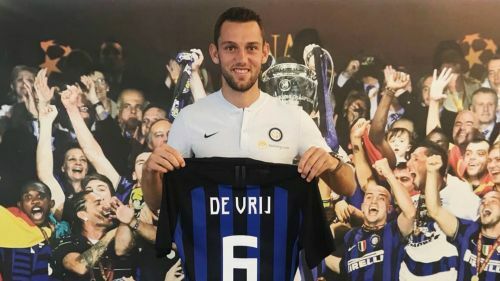 De Vrij was widely believed to be on the verge of signing for Inter on a free transfer when he lined up against his future employers on the closing day of the Serie A season in May. The defender gave away a penalty which sparked the Nerazzurri's comeback for a 3-2 victory, with the result sealing their Champions League qualification at the expense of Lazio. Inter ultimately confirmed the move in July but, speaking to the media on Wednesday, the 26-year-old insisted he had given his all for his old side. "I felt sorry for the last game, but all those who know me and who worked with me at Lazio know how much I cared and how much I gave my best," De Vrij told reporters. "Would I replay that last game? The past doesn’t change, I look in the mirror and I'm at ease. "I know that I gave everything I could in those years, right until the end." Barcelona, Liverpool and Manchester United were all linked with De Vrij prior to the announcement of his transfer to Inter. The former Feyenoord centre-back noted the Serie A side's keen interest as key to his decision to remain in Italy. "I picked Inter because of the faith the club put in me, nobody wanted me as much as they did," he said. "I believe in the project and we have the same objectives in the team. I'm convinced that I've made the right choice."